I admit it -- I'm a lip balm junkie. I try each and every one I can get my hands on. And while most do the job adequately, it's rare I come across one amazing enough to carry around with me wherever I go. Well, I've definitely found the one. And it's Sephora Brand Complete Lip Balm. I was enamored of this before I even tried it. The gleaming silver tub just looked so inviting, I couldn't help myself! It's just the right size to keep on my dresser, on my bathroom vanity or to stash inside my purse. 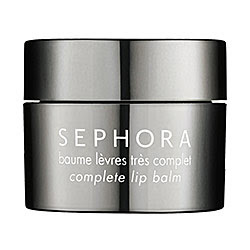 And once opened, it reveals the softest, plushest lip balm that just begs to be used immediately. My fave part, though? The delicious taste. It's slightly coconutty and makes me feel like I'm on a tropical island.